Police are appealing for witnesses after a toddler from Lancing suffered serious injuries from a large piece of timber falling on her head. Police said the three-year-old girl was being pushed in a pushchair by her mother along Preston Street, Brighton, around 10.45am on Friday (July 6). The timber is believed to have fallen from scaffolding surrounding a building, according to police, who said the toddler was taken to hospital with serious head injuries, where she remains. 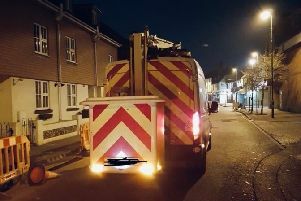 Police said a 32-year-old man from Hove has been arrested on suspicion of grievous bodily harm and a 39-year-old man from Brighton was arrested on suspicion of failing to discharge general health and safety duty at work. Detective Chief Inspector Pierre Serra said: “We are appealing to anyone who may have been walking along the street at this time to come forward with any information they have on this incident. Police have urged anyone who saw the incident to report it online or call 101 quoting reference 455 of 06/07.